HONG KONG/MUMBAI (Reuters) - Some of the founders of Infosys Ltd sold shares worth $1.1 billion in India's second-largest IT services exporter on Monday, cashing in on a more than 20 percent gain in the stock since the company picked its first outsider as chief executive. The shares were sold by N.R. Narayana Murthy, Nandan Nilekani, S.D. Shibulal and K. Dinesh, members a group of seven engineers who founded Infosys in 1981 by pooling together $250, stock market filings showed. Infosys shares have so far risen 23 percent since the company in June named Vishal Sikka, a former executive at global software firm SAP, as its CEO in a bid to revive growth. That is more than double the gain in the benchmark index for Indian stocks during the same period. Investors said the share sale had little bearing on their outlook for Infosys under Sikka's leadership. The company is in the midst of a strategy overhaul aimed at boosting earnings and stemming a staff exodus. "It's a good profit taking opportunity for any shareholder before the year ends," said Taina Erajuuri, a Helsinki-based fund manager for FIM India, which owns Infosys shares. "My outlook on the company depends on what happens in the third-quarter and how will the capital expenditure in the United States shape up next year." The four founders and members of their families sold 32.6 million shares in Infosys at a fixed price of 1,988.87 rupees each, a 4 percent discount to Friday's close, said Deutsche Bank, the sole book runner of the sale. The four were all company executives who left before Sikka took office. The sale reduces the combined stake of all the founders and their families to 5.1 percent from nearly 8 percent, Thomson Reuters data shows. Murthy, the last Infosys chairman who was also a founder, and Nilekani told Reuters they had sold their stakes for personal reasons. "Our family has tremendous confidence in the future of Infosys and its leaders," Murthy added. Sikka is trying to revive Infosys, once the posterchild of India's $100-plus billion IT industry which has in recent years struggled to innovate and retain market share. 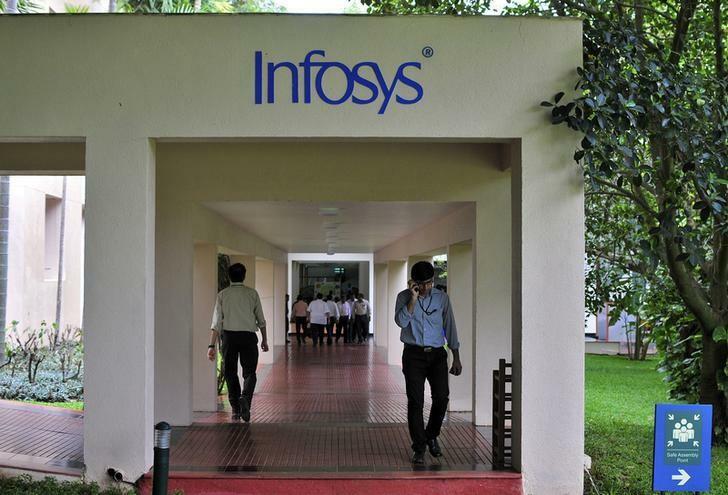 Some investors said Infosys failed to move up the value-chain due to its risk averse management team which was largely comprised of its founders and co-founders. Infosys shares ended down 4.8 percent, while the main Mumbai market index fell 1.2 percent.